To make use of the AtD extension, you need OpenOffice.org 3.2 or later and Sun Java Runtime Environment 1.5 or higher. Installing the AtD extension is a pretty straightforward affair. Grab the latest version of the extension. In OpenOffice.org, choose Tools | Extension Manager, press the Add button, select the downloaded .oxt file, and press Open. Restart OpenOffice.org, and you are done. 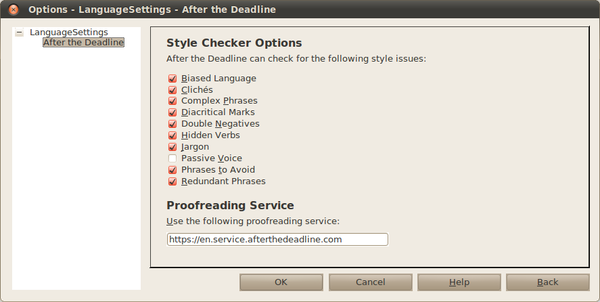 Before you start using AtD, you have to specify what kind of grammatical and style issues it should detect. To do this, choose Tools | Extension Manager, select the AtD extension, and press the Options button. Enable then the desired options by ticking the appropriate check boxes. Press OK when done. That's it, AtD is ready to go. Start typing, and when AtD detects a grammatical issue, it highlights it using a blue wavy line. Right-click on the highlighted fragment to view a brief description of the issue and its possible solution. By default, the AtD extension uses the official AtD server, which requires an Internet connection. But you can also deploy the AtD server on your machine, which lets you use the service even when you are offline. To install the AtD server, download the latest AtD distribution from the project's Web site, unpack the downloaded archive, switch to the resulting directory in the terminal, and run the ./run.sh command (or ./run-lowmem.sh command if your machine has no more than 1.5GB RAM). Next, choose Tools | Extension Manager, select the AtD extension, press the Options button, and replace the default URL in the Proofreading Service section with http://127.0.0.1:1049. Press OK, and you are done. 1. After the Deadline uses a statistical language model to detect misused words and present appropriate grammar/style suggestions. Language Tool is rule-based. This means that After the Deadline will find a broader range of English errors and present fewer false positive suggestions. 2. After the Deadline is English-only (as far as OOo is concerned). LT supports many languages. If this is important to you, then this is an important point in LT's favor. 3. After the Deadline's English rule-coverage is more comprehensive than LT. It's easier to support one language well and I had a year and a half to work on AtD full-time. 4. AtD requires an English checker because it communicates with the AtD software service. The AtD service is open source and you can run your server locally (requiring no internet then to use it). This is up to you. LT scores points because it doesn't require this. The reason for the server requirement is AtD's statistical language model. This model is huge and loading the whole thing takes up a lot of memory. If you run AtD locally, there is a low memory mode, and it works--but it's slower. I was wondering, is there any benefit of using this instead of using Language Tools?